Affordable, Ocean View Hotel with a Unique Vintage Plane Restaurant. 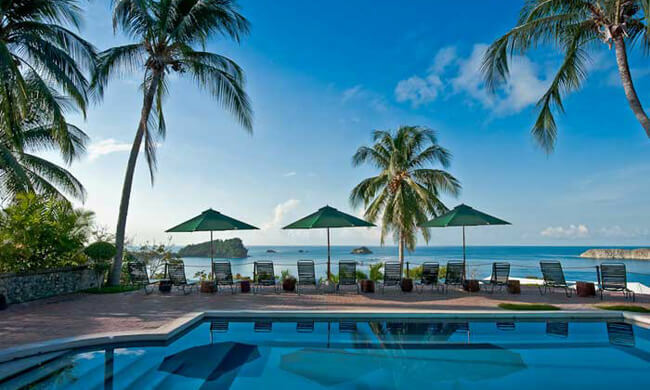 Located between Manuel Antonio National Park and the Pacific coast, Costa Verde is a lovely option for anyone searching out an authentic Costa Rica vacation, exotic wildlife, and breathtaking views. Families and couples alike are thrilled by the number of squirrel, howler, and capuchin monkeys that will be undoubtedly encountered during a stay at Costa Verde. Set along 30 acres of vibrant rainforest, Costa Verde has 70 rooms in total, with several options for accommodation including suites, studios, efficiency units, and a fantastic home harbored within a vintage Boeing 727. Each room comes with rustic furnishing, A/C, cable TV, safe, hair dryer, kitchenette, and coffeemaker. On-site offerings include a wedding pavilion, three cliffside swimming pools, four nature trails, an adults-only area (Costa Verde II), and complimentary WiFi throughout the property. The beach is about ten minutes away by foot and the local bus stops directly in front of the property. Although there is no gym, Costa Verde holds yoga and Pilates classes in the mornings daily. Private sessions are available, as well. Costa Verde’s on-site Anaconda Restaurant offers Costa Rican and international cuisine in a casual setting. They also have three additional restaurants in the surrounding area called El Avión, El Wagon, and La Cantina. All are different so be sure to try a new one every day! The area called Costa Verde II features an adults-only swimming pool with one of the best views in the area. The 520 sq. ft. studio apartments are perfect for families. Dining at El Avion takes place inside a vintage C-123 Fairchild plane. Overlooking Manuel Antonio National Park, Costa Verde has access to some of the area’s most exciting tours.